Pápai Páriz Ferenc, Album amicorum p. 352.
magna quaeque nato Juveni Domino Francisco P.
It is a matter of virtue to endure and to accomplish a lot. With this I want to greet from the deepest of my heart the young Ferenc Pápai Páriz, noble by birth and by spirit, and born for accomplish great things, a worthy son of his great father; at the same time giving a token of my devotion, offering a sacrifice to his merits and virtues, and erecting a perennial monument to my friendship. In Halle of Magdeburg, on the 8th day before the calends of September of 1712. [at the bottom of the page, written through the two pages:] Thus pages unite friends. János Csécsi (Tsétsi) was born in Gönc (Abaúj county) on June 11, 1689, the son of the Sárospatak teacher János Csécsi (1650-1708) and of Klára Rajczy. He learned in Kassa (Košice) and Sárospatak, in the latter place he was a teacher in 1707. From 1709 he went to visit foreign academies. He attended philosophy and theology in 1710 in Utrecht and in 1711-12 in Franeker, he visited England, Italy, France and Switzerland. From 1712 he lived in Sárospatak, where he became the successor of his father. He taught Greek, history, church history, Cartesian philosophy, mathematics, physics and astronomy. He came into conflict with two colleagues and the local pastor, and this constant hostility led to grave clashes between the two parties of the school. In 1723-25 an investigating committee was sent out, and finally in 1734 he and a colleague of him were dismissed from the school. After this le lived a lonely life in Sárospatak until his death in June 1, 1769. A part of his works remained in manuscript. His geography published in the translation of István Vécsei Pataki (?-1743) is the first geographical work published in Hungarian. Some of his other works: Oratio de maximo huius seculi vitio, calumnia, habita occasione examinis publici a Johannes Tseetsi j[un]. Lőcse, 1719. – Aphorismi, in quibus antiquitates veterum Hebraeorum brevissime exhibentur. Bern 1726 – Oratio secularis altero reformationis jubilaeo habita in auditorio … athenei Patakiensis ad diem XXXI. octob. 1717. Zürich, 1720. – Vetsei P. István magyar geografiája, az az ez egész világ négy részeinek … rövid le-irása. Melly … még 1741-ben Pétsen irattatott vólt … Nagykároly, 1757. 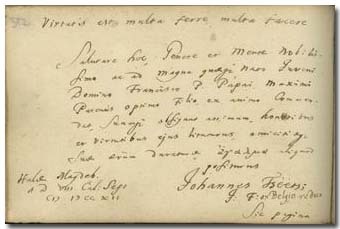 – Ifjabb Tsétsi János Havi Krónikája a Rákóczi-háború történeteiről 1703-1709. Közli Thaly Kálmán, Monumenta Hung. Hist., Scriptores 27, 1875. (in Latin). As it is attested by his note, at the end of August of 1712 Csécsi was in Halle, on his way returning home from Belgium. His father, János Csécsi Sen., as well as Sámuel Kaposi Juhász who also wrote in the album (p. 11) both had been correctors in the 1680s of the renowned Hungarian Bible of Miklós Misztótfalusi Kis published in Amsterdam. – At that time the northern part of the Netherlands was also referred to as "Belgium".